"The Cemetery" is an 1877 painting by Carl Fredrik Hill, currently on display at the Malmö Art Museum in Sweden. Hill was a Swedish born painter, born May 31, 1849, and died February 22, 1911. In the fall of 1877 he suffered from a tense situation where he hovered between arrogance and deep despair. Contact with the outside world, with his friends, became less and less. His studio door in Paris was shut. 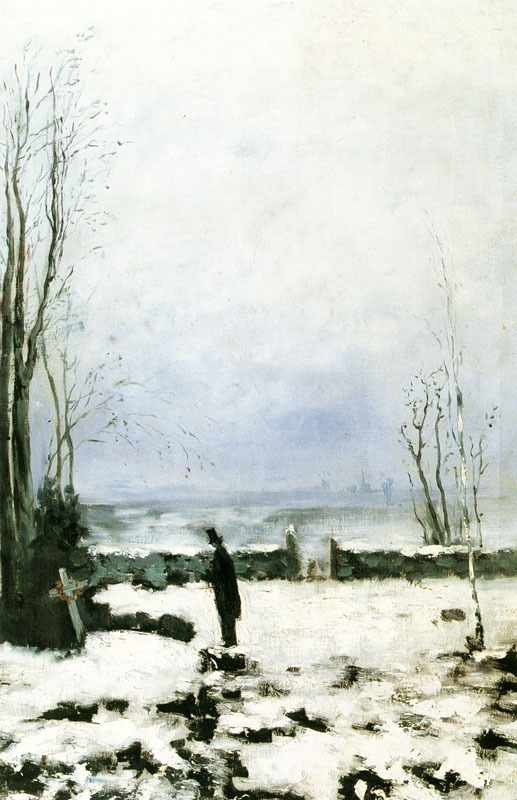 In his Christmas letters to his family in Sweden from 1877, he recounts the motifs that had occupied him, as well as those he wanted to paint in the future, including a cemetery with a man standing in front of a cross adorned with a wreath. A picture of the deepest sorrow and desolation. The lone figure's total isolation from the outside world is a dramatic and desperate moment. The painting was painted shortly before the artist's collapse. It belonged to one of the 18 paintings that Hill wanted to show at the World Exhibition in Paris in 1878. "The Cemetery" remains as one of Hill's most popular works.